The 1907 Wire Rim St Gaudens Double Eagle in High Relief is considered one of the most beautiful US coins. The $20 Double Eagle gold piece designed by Augustus Saint-Gaudens, with the strong backing of President Theodore Roosevelt, is considered by many to be the most artistically superior coin ever produced by the United States. The Saint-Gaudens Double Eagle was first minted in 1907. A total of 11,250 pieces were manufactured in “high relief”, meaning the coin’s features protrude outward further compared to normal coinage, providing greater depth and beauty than could otherwise be achieved. Unfortunately, mass production of the high relief style proved to be impractical; up to five strikes were required to flow the metal accordingly, resulting in extended manufacturing cycle time and shortened die life. A very small “wire rim” was formed along the obverse and reverse perimeter of many of the 1907 high relief pieces, caused by metal being forced up between the dies and the restraining collar during repeated strikings. Pieces lacking this characteristic are called “flat rim” examples. Later in 1907, the relief of the Saint-Gaudens Double Eagle was reduced to more ordinary heights, as it remained until production ended in 1933. The Saint-Gaudens Double Eagle theme was so widely admired that it was resurrected for gold bullion coinage issued by the US Mint starting in 1986. 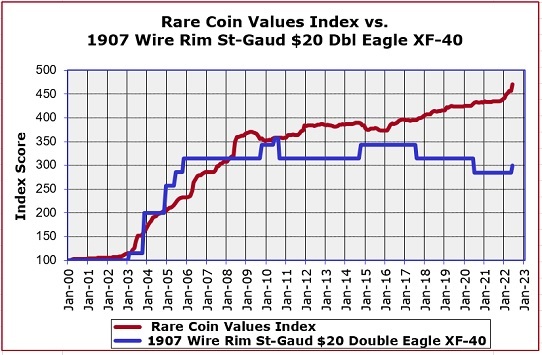 The 1907 Wire Rim St Gaudens Double Eagle High Relief variety is one of the most popular 20th century collector coins. The blue line above gives credence to this claim, as it depicts the percent increase in value since Jan 2000 of this coin in XF-40 condition. The price gains have been consistent and steep. The red line charts percent increase over the same time period of our Rare Coin Values Index, which takes the composite percent change over time of a pre-selected group of 87 rare US coins, the purpose of which is to understand the strength and direction of the overall rare US coin market. The 1907 Wire Rim St Gaudens Double Eagle in High Relief is one of the 87 coins that make up the Index. The Index is updated monthly.